"I am pleased to announce that Z. Vance Wilson, former St. Albans School Headmaster, author, and teacher, will deliver the keynote address at my installation ceremony on September 20. Vance and I worked closely together for almost 20 years, and I am deeply honored that he has agreed to speak. "If we are lucky in life, each of us has someone who, through their wisdom, kindness, and generosity of spirit, plays a pivotal role in shaping who we are professionally and personally. I was blessed to have Vance Wilson be that person for me. He is in his heart a teacher. His example and his encouragement were guideposts for me in my career, and I will be forever grateful. Perhaps the best endorsement I can offer is from my daughter Kinza, who took Vance's 'Stream of Consciousness' English elective and claims that he is the best teacher she's ever had. "Vance was named the seventh headmaster of St. Albans School in 1999, a position he held until his retirement 19 years later in June 2018. At St. Albans, he founded the School of Public Service, conducted the two largest campaigns in school history, quadrupled the school's endowment, watched over the construction of an Upper School academic building, and oversaw the reconstruction and expansion of the athletic fields—all while continuing to teach English. 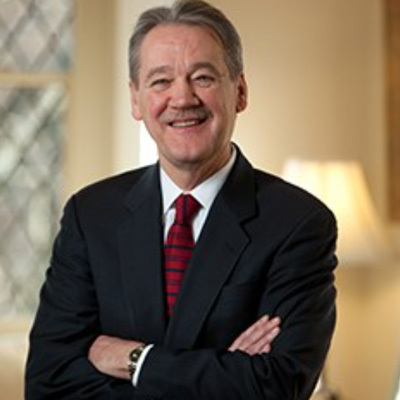 He has served on the boards of the Asheville School, Roxbury Latin, and the National Association of Episcopal Schools, and he served as president of the International Boys' School Coalition Board of Trustees. "He began his teaching career in 1974 at the Lovett School in Atlanta, where he was quickly promoted to Head of the Upper School; subsequently, he worked as a teacher and administrator at Asheville School in Asheville, North Carolina; Tower Hill School in Wilmington, Delaware; and Bryn Mawr School in Baltimore, Maryland, where he was the Associate Head of School. "A recognized leader in education, Vance has authored or co-authored four books addressing topics in education: Each Day: A Veteran Educator's Guide to Raising Children (2016), Taking Measure: Perspectives on Curriculum and Change (1998), Paths to New Curriculum (1991), and They Took Their Stand: The Integration of Southern Private Schools (1983). He published an award-winning novel, The Quick and the Dead, in 1987. "Born in North Carolina and raised in Florida, Vance attended Berkeley Preparatory School in Tampa and earned a Bachelor of Arts in English from Yale University, where he also played basketball and was a Rhodes Scholarship nominee. He went on to earn a diploma in Anglo-Irish literature from Trinity College, University of Dublin, and a master's degree from the University of Virginia." We look forward to welcoming Mr. Wilson to campus. In addition to speaking at installation, Wilson will present to faculty and staff on Wednesday, September 19.